Scratchpads are an online virtual research environment for biodiversity scientists, allowing anyone to share their data and create their own research networks. Sites are hosted at the Natural History Museum London, and offered freely to any scientist that completes an online registration form. Sites can focus on specific taxonomic groups, or the biodiversity of a biogeographic region, or indeed any aspect of natural history. Scratchpads are also suitable for societies or for managing and presenting projects. 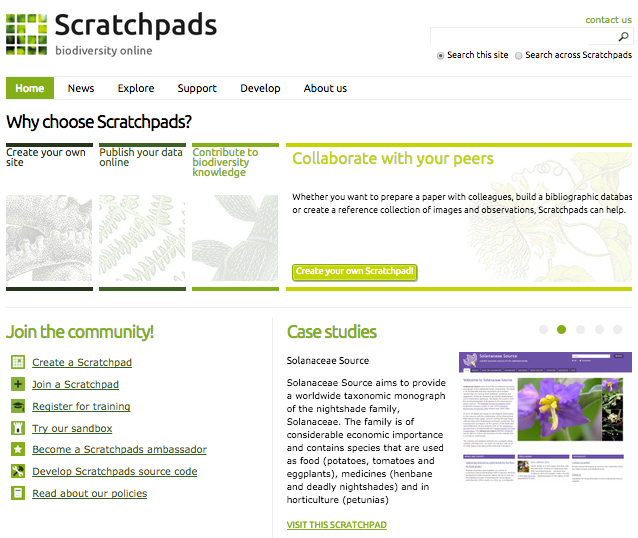 Key features of Scratchpads include: tools to manage biological classifications, bibliography management, media (images, video and audio), rich taxon pages (with structured descriptions, specimen records, and distribution data), and character matrices. Scratchpads support various ways of communicating with site members and visitors such as blogs, forums, newsletters and a commenting system. Translations of the Scratchpads software are available via our localization server and site content can be created in multiple languages. The Scratchpads Virtual Research Environment is developed and supported by the Natural History Museum, London. It has received funding from several European Union and UK funded projects including the EU-FP6 EDIT and FP7 ViBRANT projects as well as the NERC-funded eMonocot Project. Scratchpads are an online virtual research environment and allow users to manage many categories of kinds of structured biodiversity data. Each Scratchpad can create a Darwin Core Archive of the data contained within a site which can be used for sharing data with the Global Biodiversity Information Facility (GBIF), Encyclopedia of Life (EOL) and other data aggregators. The location of the archive is specific to each Scratchpad, and are centrally registered as resources with GBIF. In addition, each Scratchpad maintainer can create CSV and XML data endpoints for their site’s data which can be harvested externally. eMonocot: A project to aggregate information on the taxonomy and distribution of monocot plants. Each major monocot family using a separate community Scratchpad and these data are centrally aggregated through the e-monocot portal. Encyclopedia of Life (EOL): Scratchpads replace the EOL LifeDesk system which was one of the systems previously used to supply community contributions to Encyclopedia of Life. An example of an EOL contributing site is Antkey, a community resource for the identification of invasive, introduced and commonly intercepted ant species from across the globe. AVIS-IBIS: The Avian Information System (AVIS) is an extensive database information system about all birds of the Indian subcontinent in the series of web-based portals under IBIS to contribute plethora of information available on birds to science and conservation. Flora of Thailand: The e-Flora of Thailand aims to provide a web-based flora as a decentralized platform where authors manage, share, and publish taxonomic data online. It will eventually bring together taxonomic data of all of Thailand’s 303 plant families, with keys, descriptions, uses, illustrations, maps, and high-quality photographs of the estimated total number of 10,624 species. Scratchpads are built on top of the Open Source CMS, Drupal. Drupal has been extended with over 150 custom modules developed by the Scratchpads development team, and over 100 contributed modules developed by the Drupal community. The majority (>700 of ~750) of the Scratchpads are hosted at the Natural History Museum, London (NHM). The current setup, which has been honed and improved since its initiation in 2007, uses a single load balancing server running Varnish, two application servers running Apache/PHP, two data servers running Percona (MySQL) and Memcache, and one search server running Apache Solr. This setup can be easily extended to increase capacity for more users or more Scratchpads. Sites are managed using Aegir, a Drupal specific tool for creating and managing Drupal websites.